Nassau, The Bahamas – Marine conservation is integral for the survival of small, low-lying countries like The Bahamas, and a new voice is emerging to help support and fund existing conservation groups in the country. The Bahamas Protected Areas Fund, the first of its kind conservation trust in The Bahamas, has formally established its office at the Old Fort Bay Town Centre in New Providence. A tremendous accomplishment for the country, the Fund is tasked with ensuring sustainable financing for the management of protected areas, other natural resources, and adaptation to and mitigation of the effects of climate change. The roots of the Bahamas Protected Areas Fund (BPAF) goes back to the country’s efforts to protect ecologically diverse areas across The Bahamas, such as the Blue Holes National Park and Westside National Park in Andros, the Inagua National Park, and the Adelaide Creek Wild Bird Reserve that contribute to approximately 14 million acres currently protected across the country. These areas have been proven to be both ecologically and socio-economically beneficial to The Bahamas in a number of ways – maintaining breeding grounds, supporting tourism, providing food, and mitigating against strong storm events. A recent study commissioned by the Bahamas Reef Environment Educational Foundation (BREEF) estimated that marine protected areas alone contribute at least $5 billion to the country annually. “This is a time of which we can proud, when we as a country have put measures in place to safeguard the resources of our beautiful islands”, said Kelley Bostwick-Toote, Chairperson of the Fund. “I am especially pleased to see both The Government of The Bahamas and private sector come together to make the establishment of this office possible. We are grateful for the generous office space donated by Terry White of the New Providence Development Company Ltd., as well as the donation of our furnishing provided by AndBank (Bahamas) Ltd”. Executive management and control of the Fund rest with its Board of Directors, supported by an Executive Director. The Fund commenced its operations in 2017 and has worked with key partners, including The Nature Conservancy and the Caribbean Biodiversity Fund, to establish operating policies and procedures and to strengthen its governance. Executive Director Karen Panton said, “we are now positioned to open our doors to the public in preparation for the roll- out of our Grants Program”. The Grants Program is in progress and will be funded by sustainable finance mechanisms, contributions from the Caribbean Biodiversity Fund, grants, and general philanthropic activities. “The gap in funding for the effective management of protected areas is $10.5 million annually,” said Ms. Panton, “but we are strategizing to make an impressive dent in that number so we can support conservation on the ground”. Grants will be provided to protected area managers – including the Bahamas National Trust, the Ministry of Environment, The Department of Marine Resources, NGOs, the University of The Bahamas, research institutions, and other organizations whose purpose is aligned with the Fund. The official opening of the Bahamas Protected Areas Fund is slated for April 26 at Old Fort Bay Town Centre. The Minister of Environment, the Hon. Romauld Ferreira, M.P., will be performing the official opening rites. The Board will also recognise the contributions of various partners and supporters, including the WAITT Foundation, and give a brief summary of its strategic objectives through 2022. For further information on the Fund or its official opening, please contact Karen Panton at (242) 698-1152 or (242) 437-2168. You may also reach the Fund at info@bahamasprotected.com or visit us at www.bahamasprotected.com. 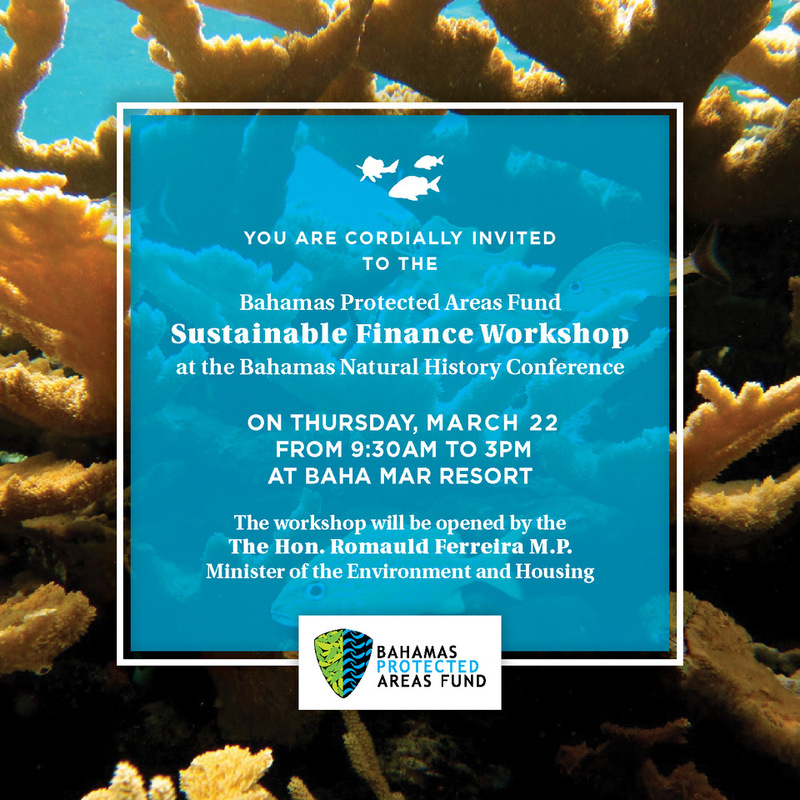 The Bahamas Protected Areas Fund (BPAF), via funding from the WAITT Foundation, is soliciting proposals from across the region for a Sustainable Finance Consultant. The consultant will work with the BPAF to develop detailed designs for the implementation of three sustainable revenue options. We are inviting firms to submit a fixed-price proposal in accordance with the attached “Terms of Reference” (TOR). Within the TOR, you will find all the information necessary to conduct a proper assessment of BPAF’s requirements. Should you have questions, however, please submit to the Executive Director at the email below. The consultant will be selected in accordance with the criteria identified in the TOR. Final proposals should be submitted by email to info@bahamasprotected.com to arrive no later than 3 pm EDT on Friday, June 15, 2018. Please quote “Consultancy for Sustainable Finance Options” in the subject line. Kindly respond to all sections of the TOR.